Jean Laffite could have been a model for Pirates of the Caribbean. 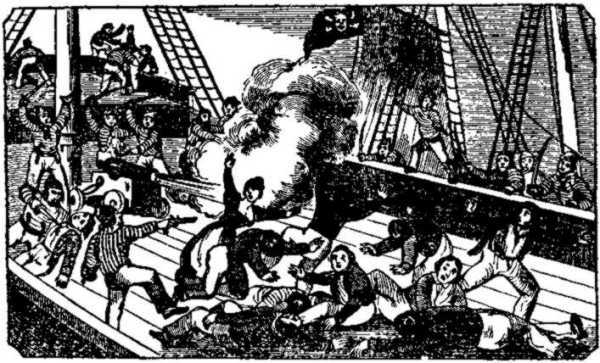 Variously called the “gentleman pirate,” the “terror of the Gulf” and the “hero of New Orleans,” his life is shrouded in myth. Jean Laffite was probably born around 1782 in a village in Bordeaux, France. His older half-brother Pierre was born around 1770 to the same father but a different mother. Their father was a middle-class merchant and trader. Both brothers received some basic schooling. They started their seafaring career on the Gironde estuary, on vessels owned by or trading with their father. They left France around 1800 and wound up in the French colony of Saint-Domingue (present-day Haiti), where they worked as merchants and privateers. Piracy was the unlawful taking of one privately-owned vessel by another. Privateering, on the other hand, was a legitimate way for a pirate to ply his trade during war. To help finance the war effort while damaging the economy of its enemies, a government would issue “letters of marque and reprisal” (essentially government licences) to qualified private vessels. This authorized them to capture enemy merchant ships. The privateers armed, equipped and crewed their ships at their own expense. They also posted a cash bond as a guarantee that they would observe the rules of war and respect civilian life. Privateers were supposed to bring their prizes into a port of the country that granted them the letters of marque, or the port of a friendly nation. There an admiralty court was supposed to examine the ship’s papers, listen to testimony and consider other evidence to decide whether the prize had been lawfully taken. If the court awarded possession of the prize to its captors, the prize ship and its cargo were sold. The proceeds were shared among the privateer crew, investors and the government whose flag the privateer flew. During the Napoleonic Wars, almost all pirates became privateers, since letters of marque were easy to obtain. Privateers were not scrupulous about the nationality of their prizes. The English and the French preyed on each other, and both preyed on Spain. European privateers – including Jean Laffite – frequently captured American vessels, ignoring the rights of the weak, neutral United States. In 1803 France lost Saint-Domingue in a slave revolt. Many French privateers, including the Laffite brothers, went to New Orleans. Napoleon had just sold the enormous territory of Louisiana – which had been under French, and then Spanish, rule – to the United States. American officials did not search ships as carefully as their Spanish predecessors had. Privateers wanting to come into New Orleans to unload goods and slaves, or to take on men and arms, would often pretend to be making an emergency stop for repairs. Another ruse was to bypass the customs inspector at the Balize (at the mouth of the Mississippi) and smuggle goods into points on the Mississippi below New Orleans. From there they could be taken to the city for disposal. Local merchants were happy to buy goods with no duty attached. The French and Creole (descendants of the French and Spanish) population welcomed privateers’ wares. The district court winked at piracies committed in local waters. Pierre and Jean Laffite became the ringleaders of a sprawling operation based on an island in Barataria Bay, south of New Orleans. They controlled every stage of the business, from capturing goods on the high seas to distributing and selling smuggled merchandise. They didn’t bother to obtain legitimate letters of marque for their vessels. It was easier and more profitable to dispose of captured cargo illegally. They organized regular auctions at places like the “Temple” (halfway between Barataria and New Orleans), where they sold trafficked slaves and smuggled goods at bargain prices. Jean Laffite oversaw operations in Barataria. Pierre Laffite remained in New Orleans to maintain connections with local merchants and officials. The Laffites’ activities caused growing problems for the United States government, which was obliged to protect neutral commerce in American waters. In March 1813, Louisiana Governor William Claiborne issued a formal proclamation against the Barataria “banditti.” He offered a $500 reward for the capture of Jean Laffite. Laffite responded by posting a signed handbill offering a $1,000 reward for the capture of the governor. This had no immediate effect, as Pierre had already broken out of jail. Claiborne proceeded with an already-planned expedition to destroy the Barataria smuggling base, which the navy did on September 16. By October, however, General Andrew Jackson, tasked with the defence of New Orleans, was eager for any help he could find. He particularly wanted men and gunflints, which the Laffites had in abundance. Both Jean and Pierre Laffite were assigned to Jackson’s staff, acting mainly as couriers. Their men performed well against the British attack on January 8, 1815. Jackson praised them in his congratulatory address to the army. The Laffites and their followers had been promised a full presidential pardon. The charges of smuggling and piracy were dropped. It is questionable whether the pirates made a decisive difference to the outcome of the Battle of New Orleans. They made up a very small proportion of Jackson’s forces. However, had Laffite chosen to help the British, the results of the battle could have been quite different. The Laffites’ next money-making scheme entailed serving as spies for Spain in the Mexican War of Independence. The brothers became party to a plan to assist the Mexican revolutionaries through a land campaign against Texas and a maritime assault at Tampico. Rather than risk themselves in the adventure, they fed Spain information about the insurgents’ plans. With their earnings from Spain, they hoped to re-establish their fleet, and they hoped that Spain might allow them to privateer as a cover for their espionage. In 1816 Jean Laffite and his friend Arsène Latour undertook a secret mapping expedition on behalf of Spain. They traversed the Missouri Territory (later the Arkansas Territory) to the navigable headwaters of the Arkansas River, a journey of over 1,500 miles. You can read about this expedition in the Encyclopedia of Arkansas History & Culture. In April 1817, Jean Laffite gained control of Galveston Island, a largely uninhabited part of Spanish Texas. He developed it into a new smuggling base. The colony (named Campeche) eventually numbered as many as 300 men and a few women. Laffite issued letters of marque that authorized ships sailing from Galveston as privateers, with permission to attack ships from any nation. His admiralty court legalized all prizes. Though ostensibly operating under the flag of the Mexican revolutionaries, Laffite provided no aid to the revolution. Thousands of slaves were illegally smuggled from Texas to Louisiana via Laffite’s operation at Galveston. The settlers continued up the Trinity and established the “Champ d’Asile.” By July, the colony had foundered and the survivors returned to Galveston, where they set up camp not far from Laffite’s village. While they were there, Galveston Island was hit by a hurricane. Jean Laffite used his own resources to feed the Bonapartists. He helped them return to New Orleans, thus earning their gratitude. He may have contemplated handing them over to Spain, though by that point the Spaniards – frustrated with Laffite’s double-dealing – had dropped the Laffites from their payroll. The hurricane badly weakened Laffite’s operation. He got a slight boost in 1819 when James Long – a former US Army surgeon who succeeded in occupying Nacogdoches and proclaimed himself President of the short-lived Republic of Texas – appointed him “governor and commander-in-chief of the Island of St. Luis and the Port of Galveston.” Long empowered Laffite to grant letters of marque against Spanish shipping. Meanwhile, intelligence furnished by the Laffites helped Spain attack Long and expel the filibusters. By then the US government wanted Laffite’s establishment broken up. They were afraid it could start an international incident that would put at risk the Transcontinental Treaty (also known as the Adams-Onis Treaty) of 1819, which settled the boundary between the United States and New Spain (Mexico). The agreement obligated Washington to prevent American citizens, and expeditions backed by Americans, from making incursions into Spanish territory. The USS Enterprise was sent to Galveston to remove Jean Laffite from the Gulf. Laffite agreed to leave without a fight. He departed on May 7, 1820, setting fire to most of the settlement. Pierre Laffite wound up the business in New Orleans. He sailed south to the Yucatan Peninsula, where he died of a fever on November 9, 1821 after a gunfight with Spanish soldiers and civilians (see my post about George Schumph and the death of Pierre Laffite). Jean Laffite established a base along the coast of Cuba and continued to sail as a pirate, taking Spanish ships in the Gulf of Mexico. In April 1822, he was captured after attacking an American ship. The Americans turned him over to Cuban authorities, who released him. He sailed to Colombia, where the government was commissioning private armed vessels in a naval auxiliary. The Colombians gave Laffite a commission and a 42-ton schooner, called the General Santander. He would be allowed to take prizes, and to share in the proceeds. In February 1823, Laffite attempted to take what appeared to be two Spanish merchant vessels near Omoa, Honduras. They turned out to be privateers or warships and returned heavy fire. Wounded in the battle, Jean Laffite is believed to have died just after dawn on February 5, approximately age 40. He was buried at sea in the Gulf of Honduras. Jean had a son with his mistress, Catherine Villard, on November 4, 1815. The boy, named Jean Pierre, died in October 1832. Pierre had many children with Catherine’s sister Marie. Napoleon in America is based on one of many unsubstantiated tales about Jean Laffite. According to the story behind Napoleon House, pirates associated with Laffite were planning to rescue Napoleon from exile on St. Helena and bring him to New Orleans to live. On the day they planned to sail, they learned that Napoleon had died. Jean’s name remains preserved in the town of Jean Lafitte, Louisiana, and in the Jean Lafitte National Historic Park and Preserve. You will notice that his last name is often spelled “Lafitte.” However, as Jean and Pierre themselves always spelled their name “Laffite,” that is the spelling used in Napoleon in America. You can find a large number of internet articles about Jean Laffite. Most of them contain inaccuracies and some use images that are not (but purport to be) of Laffite. If you’re interested in some of the misconceptions about him, see the “Talk:Jean Lafitte” page on Wikipedia. The Laffite Society of Galveston has a good website. Pam Keyes has written an excellent article about Laffite’s role in the Battle of New Orleans on the Historia Obscura website. If you want to learn more about the Laffite brothers, read the well-researched The Pirates Laffite: The Treacherous World of the Corsairs of the Gulf, by William C. Davis (2005). Alfred Toledano Wellborn, “The Relations between New Orleans and Latin America, 1810-1824,” Louisiana Historical Quarterly, Vol. 22, No. 3 (July 1939), p. 754. Arsène Lacarrière Latour, Historical Memoir of the War in West Florida and Louisiana in 1814-1815, translated by H.P. Nugent (Philadelphia, 1816), Appendix, p. xii. Jack Autrey Dabbs, “Additional Notes on the Champ-d’Asile,” The Southwestern Historical Quarterly, Vol. 54, No. 3 (Jan. 1951), p. 353. Charles W. Hayes, Galveston: History of the Island and the City (Galveston, 1974), Volume 1, p. 43. Thank you, Jerry. That sounds wonderful. I’ll see if I can make it. Meanwhile, I’ll be speaking at the Napoleonic Historical Society conference in New Orleans in November, and I believe dinner at Antoine’s is on the agenda. I look forward to meeting you in person and to eating some of your famous pastries. My last name is slightly different but could it be that Jean ended up in Cuba? I have an 1890’s passport of my great great great (?) cuban aunt asking to enter to Mexico. Thank you for this article, I will definitely read further on. Thanks, Adriana. It’s unlikely Jean ended up in Cuba, but as there are different accounts of how and when he died, it’s not beyond the realm of possibility. The Laffite Society in Galveston provides more information about the Laffite brothers’ genealogy, and invites people who think they might be related to Jean or Pierre Laffite to contact them with documentation: http://thelaffitesociety.com/Laffite_Relatives.html. The site also talks about the different spellings of Laffite (see FAQs – Genealogy). Good luck with your quest for information. I may have evaded the payment of duties to the custom house; but I have never ceased to be a good citizen; and all the offence I have committed, I was forced to by certain vices in our laws.